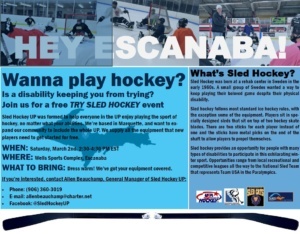 Sled Hockey U.P. was formed to help everyone in the U.P. enjoy playing the sport of hockey, no matter what your abilities. We’re based in Marquette, and want to expand our community to include the whole U.P. We supply all of the equipment that new players need to get started for free.